1. Prepare vinaigrette by placing shallot, vinegar, and lemon juice in a small bowl. Whisk in olive oil and season with salt and pepper. 2. Place salad greens in a large bowl with the vinaigrette. 3. Add 1/2 pomegranate seeds, grapes, and walnuts. Toss into salad. 4. 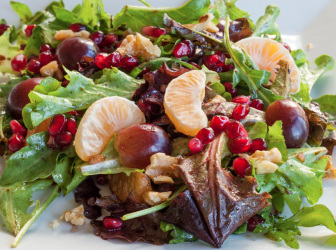 Sprinkle remaining pomegranate seeds, grapes, and walnuts over salad. 2. Heat the oil in a 5 qt. pan. Saute the onion, garlic, red pepper and celery for 7-10 min. Cover so that the steam helps them cook. 4. Add the pumpkin, stock, broccoli, tomatoes, dried fruit and spices. Simmer, uncovered for 20 min. 5. Garnish with roasted pumpkin seeds if desired. 2. In a small bowl, toss together cranberries almonds, flaxseed, brown sugar, cinnamon and nutmeg until all the ingredients are evenly mixed. Set aside. 3. To prep the apples, keep the peels on. Working from the stem end, core each apple stopping about 3/4" from the bottom. 4. Divide the cranberry mixture evenly among the apples, pressing the mixture gently into each cavity. Arrange the apples upright in a heavy ovenproof saute pan or small baking dish just large enough to hold them. 5. Pour the apple juice and water into the pan. 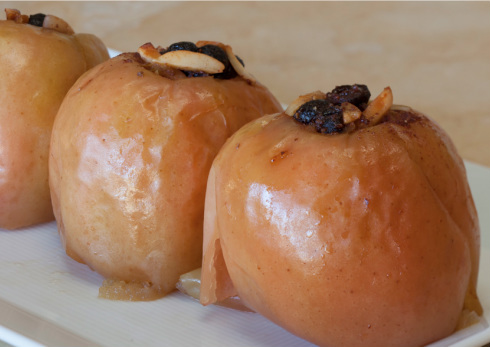 Drizzle honey and oil evenly over the apples and cover the pan snugly with aluminum foil. Bake until the apples are tender, about 50-60 min. 6. Transfer the apples to serving plates and drizzle with pan juices. Serve warm or at room temperature. This salad is very low in cholesterol and sodium. It is a great way to begin your meal and get a boost of antioxidants from the pomegranate seeds. It is a very good source of vitamins A and K as well as a good source of vitamin C and manganese. 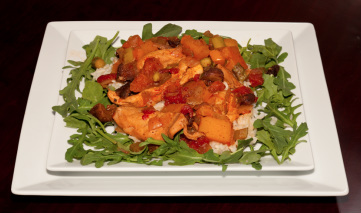 This stew is full of health promoting ingredients. It is low in saturated fat and a very good source of protein, vitamin A and vitamin C. It contains good amounts of vitamin K, niacin, B6 and selenium. These apples are a fun way to end the meal. They are low in saturated fat and have no cholesterol. Apples are a good source of fiber and using the skin gives some added nutrients. In addition, they have a good amount of vitamin E and manganese.